I was asked recently by Anthony Davis about confidence and how to be confident when one doesn’t necessarily feel very confident. If this is something you suffer from please watch the video HERE and please send me any other questions or issues you would like exploration of and we shall find the solution and prescribe the perfect sandwich for your ailment. Darling. We are in the midst of a terrific onslaught of negativity in the world and therefore it is more necessary than ever to counteract the maelstrom with a decent sandwich, dressing up and valuing yourself in the kitchen. How can one hope not to be floored by whats what in the world if one isn’t even capable of sorting out a decent sandwich in ones very own cuisine? 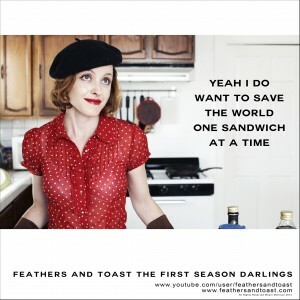 Join us in the revolution against falling apart and for saving the world one sandwich at a time. Please click HERE to watch the video.